Free coupons are inviting frontline military personnel to the Gospel of Jesus Christ. 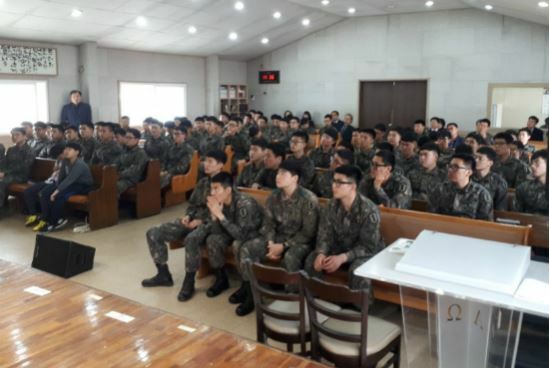 The coupons are distributed by Sanseong Gunin (fortress soldiers) Church (photo) at the 8191st Army Unit in Munsan-eup, Paju City, Gyeonggi-do, to connect new believers to local churches, utilizing their cafes. The slogan is “Like dew, your youth will come to you” (Psalm 110:3). The church issues free coupons to soldiers going on vacation. The coupons are for cafes operated by the churches nearby the camp or in the soldiers’ hometowns. The local churches receive memos about their potential visitors, pray for them, and welcome them. Thinking about this, Rev. Cho realized it was a perfect opportunity for new believers, having begun their faith journey at the military base, to visit local churches comfortably during vacation and nurture their faith. Rev. Cho visited the Presbyterian Church of Korea (PCK Tonghap) Division of Military Mission, and presented his idea. Rev. Cho made a list of all churches with cafes. When he called them and explained how the “coupon mission” worked, most churches were positive. Some churches had no cafe of their own, but had members who ran cafes and said they would welcome “visitors” there and give them food and drinks. Rev. Cho also sends texts to vacationing soldiers with good wishes for their vacations and contact information for local church pastors. A few days ago, Rev. Cho received a text from a soldier saying, “I’ve completed my mission, pastor.” With it was a photo taken with the pastor of the church he’d visited.